When Pope Benedict XVI retired unexpectedly in February, it left a lot of questions unanswered for the Catholic Church. Among those for Catholics in Philadelphia was: will the new Pope still visit here in 2015? At the 2012 World Meeting of Families in Milan, Benedict announced Philadelphia as the event’s next host in 2015, much to the delight of Mayor Michael Nutter and GPTMC; The Vatican later confirmed that Benedict would personally attend. 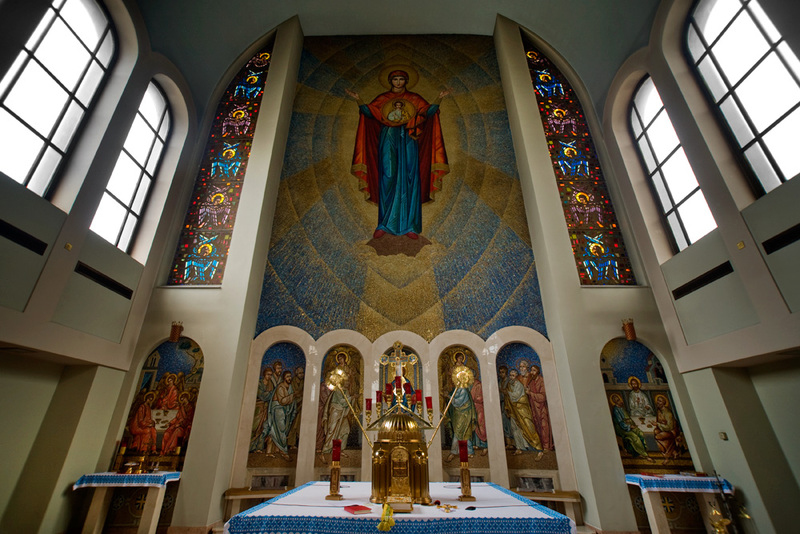 With Benedict’s successor Pope Francis having just returned from a wildly publicized visit to Brazil, it’s especially fresh on the minds of Philly Catholics, including those at the Ukrainian Catholic Cathedral of the Immaculate Conception of the Blessed Virgin Mary, where Pope John Paul II visited in 1979. “[The World Meeting of Families] is still on our schedule,” says Father Ivan Demkiv, the Cathedral Rector. “We’re planning on him visiting here.” A visit by Pope Francis would assuredly be the high mark of the Cathedral’s 50th year. 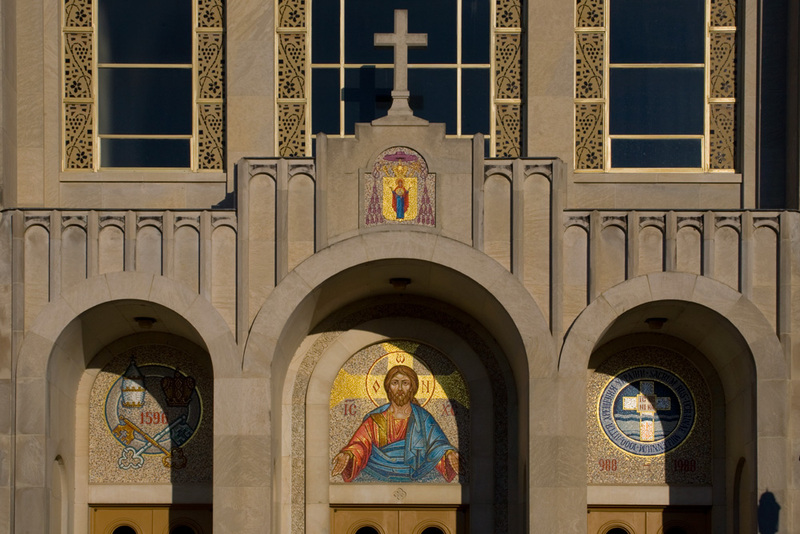 Built from 1963–66 at 830 North Franklin Street, the Ukrainian Cathedral was designed by Julian Jastremsky, native of Winnipeg, Canada, where a large portion of that country’s Ukrainian population—4 percent of Canada’s 35 million people—resides. 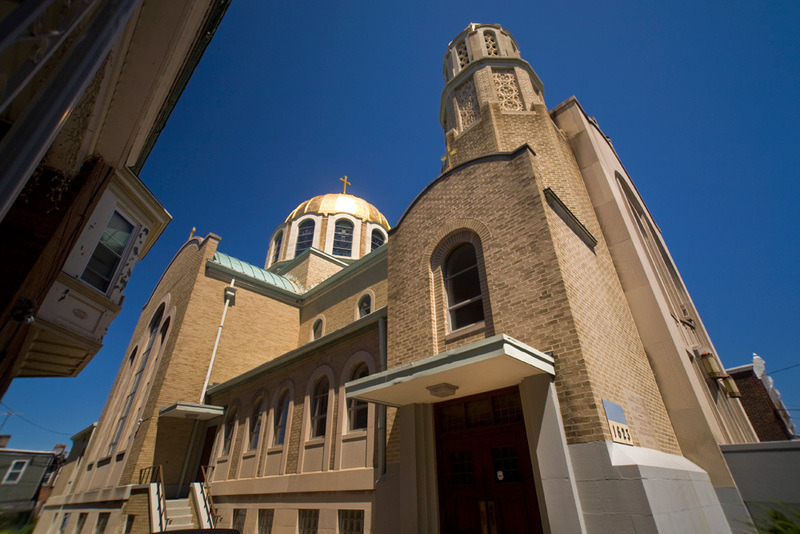 Most Reverend Stefan Soroka, Archbishop of the Ukrainian Catholic Archeparchy of Philadelphia, is a Winnipeg native, and Father Ivan himself relocated from Ukraine and lived there for two years before moving to Philadelphia to lead the Cathedral in October 2003. 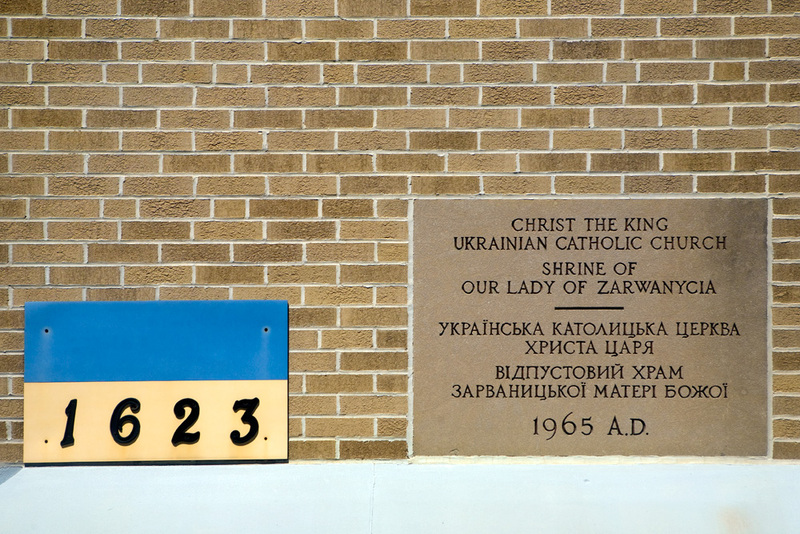 Nevertheless, the Ukrainian Catholic Church kept Jastremsky busy in the 1960s. 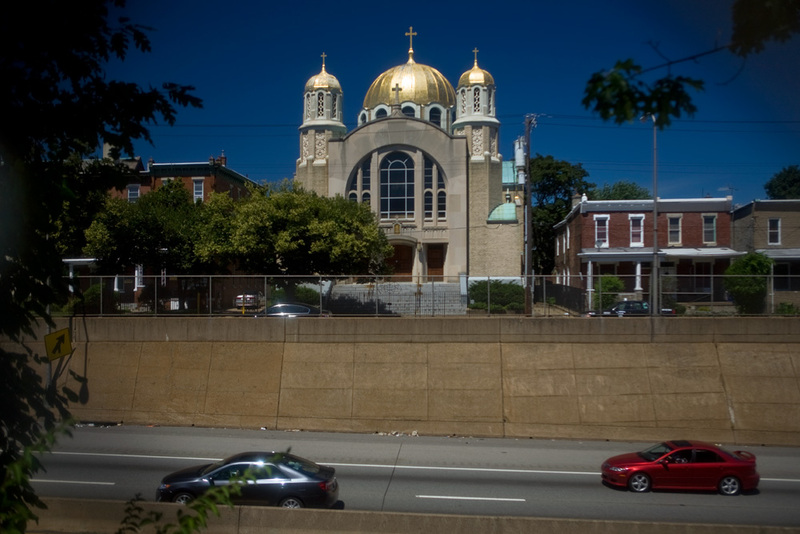 His St. John the Baptist opened in Newark, New Jersey in 1965, the same year his Christ the King parish opened on West Cayuga Street, towering over the new Roosevelt Expressway, which opened in 1961 to connect Northeast Philadelphia with the Schuylkill Expressway. 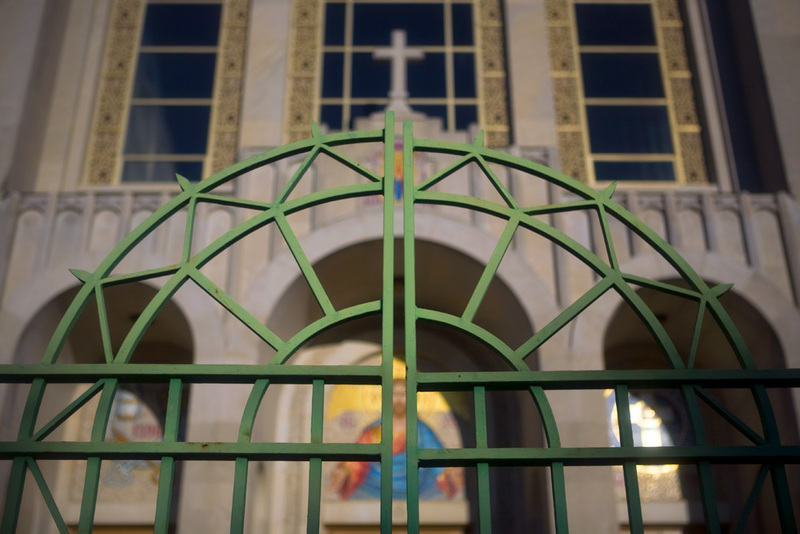 The point-and-cross motif of the fence and gate at the Ukrainian Cathedral is echoed here. Without a doubt, though, the Ukrainian Catholic Cathedral is Jastremsky’s magnum opus. Using simple geometry, notably the arches repeated throughout the Cathedral, and drawing on Slavic and Byzantine influences, the Cathedral interprets Hagia Sophia, whose construction began in the 6th Century, when Istanbul was still Constantinople. 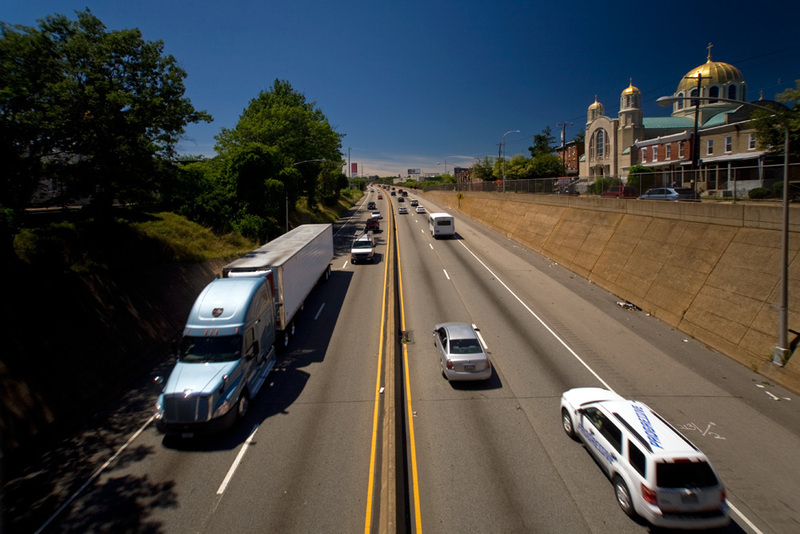 It’s the unmistakable landmark of the area where the Northern Liberties and East Poplar neighborhoods blur. 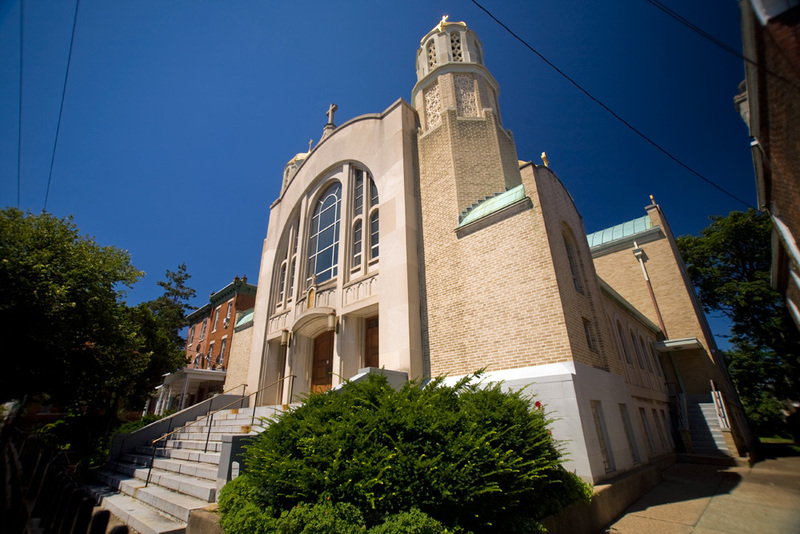 And the Cathedral is only one of a many-building complex that also includes the Treasury of Faith Museum, the Byzantine Church Supplies store, the Archdiocese facilities, the cafeteria which makes and sells pierogies, and of course the Rectory. 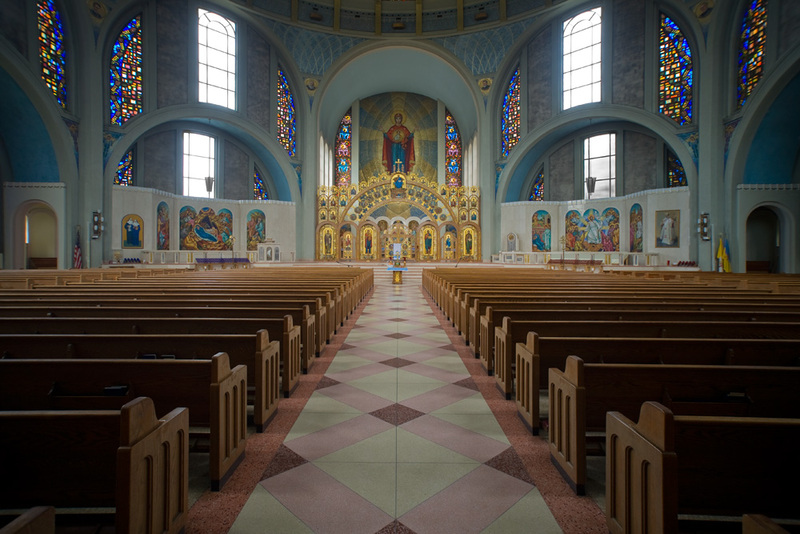 The complex replaced the original cathedral purchased in 1907 by the first bishop of Ukrainian Catholics in America, Bishop Sotor Stephen Ortynsky, whose earthly remains are contained in the Cathedral’s crypt. 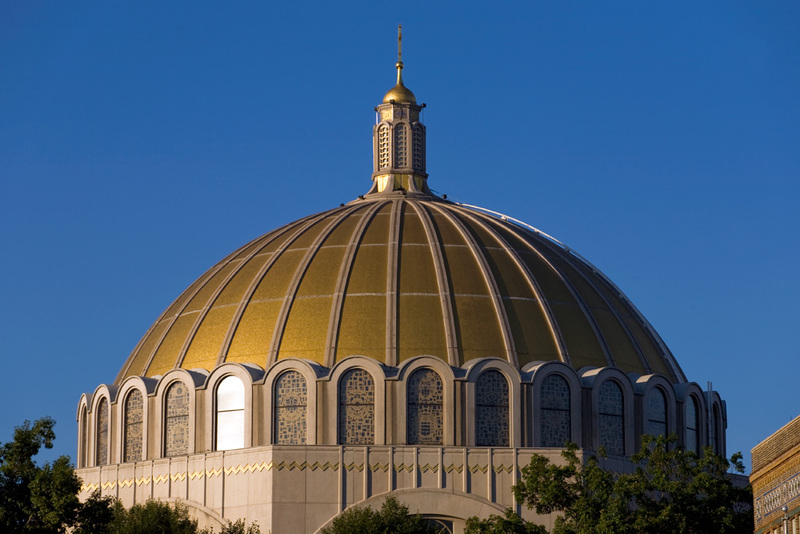 The Cathedral’s concrete frame and limestone skin are topped by its signature dome—100′ in diameter and 106′ in height—covered in one quarter inch thick Venetian glass tiles infused with 22 karat gold. 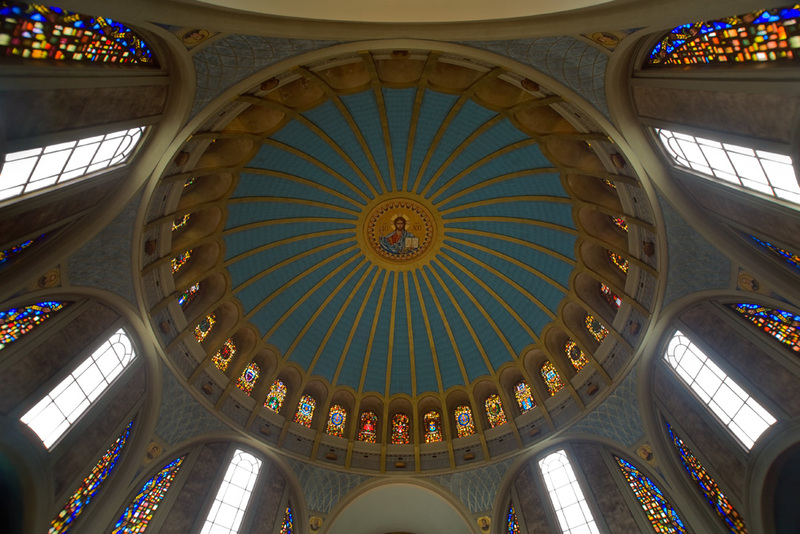 The interior of the dome, rising directly above the nave, features a mosaic of the Pantokrator, Christ the Almighty Ruler on a background of traditional Ukraine blue and yellow. 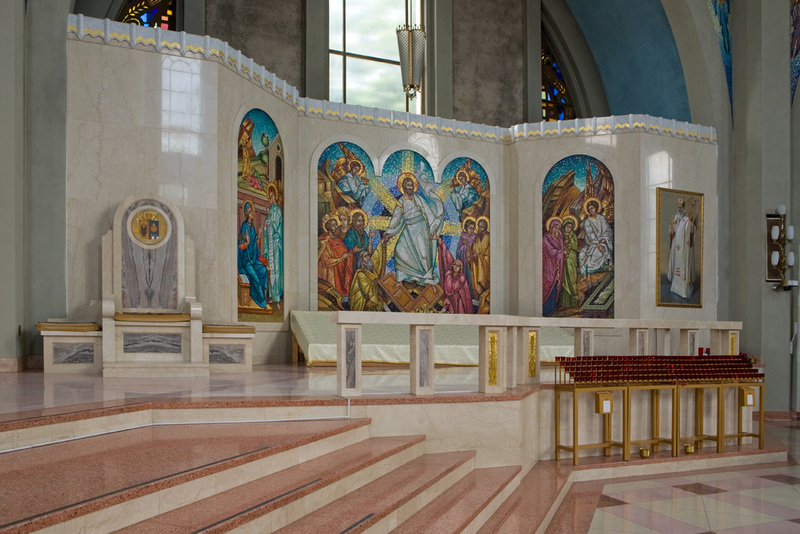 The mosaic’s design, and other icons in the Cathedral, come from iconographer Chrystyna Dochwat, whose résumé also includes icons at the National Shrine of the Immaculate Conception in Washington, DC and the Ukrainian Catholic University in Rome. 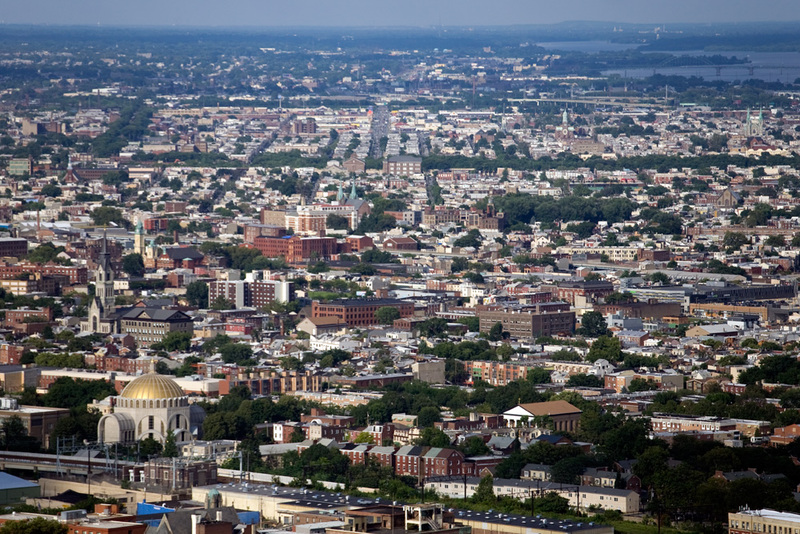 Dochwat still lives in the Philadelphia region. 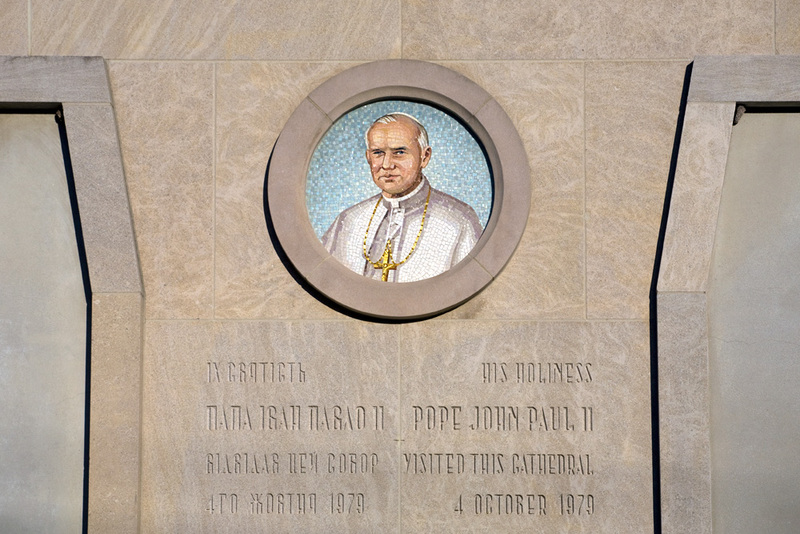 She was there on October 4, 1979 when Pope John Paul II came to Philadelphia, the last pontiff to do so. 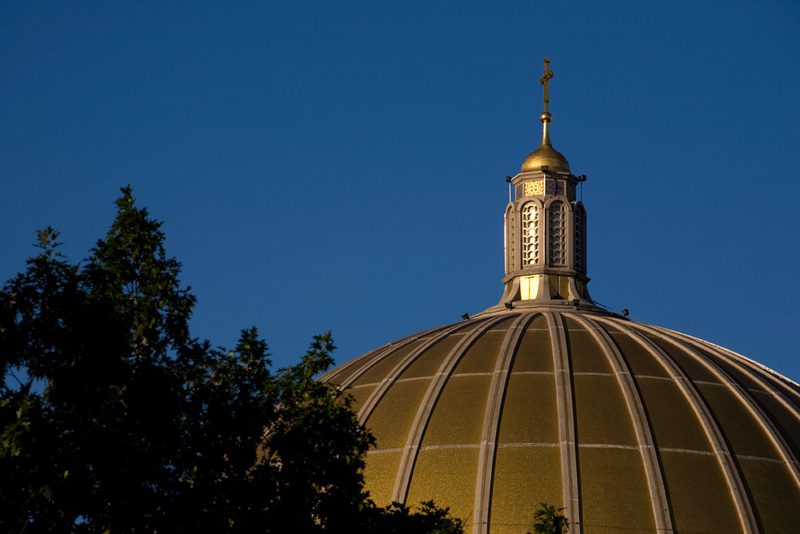 After Mayor Frank Rizzo kissed his ring on the airport runway, the Pope held mass outside the Cathedral Basilica of Saints Peter and Paul, attended by a million people on the Parkway. 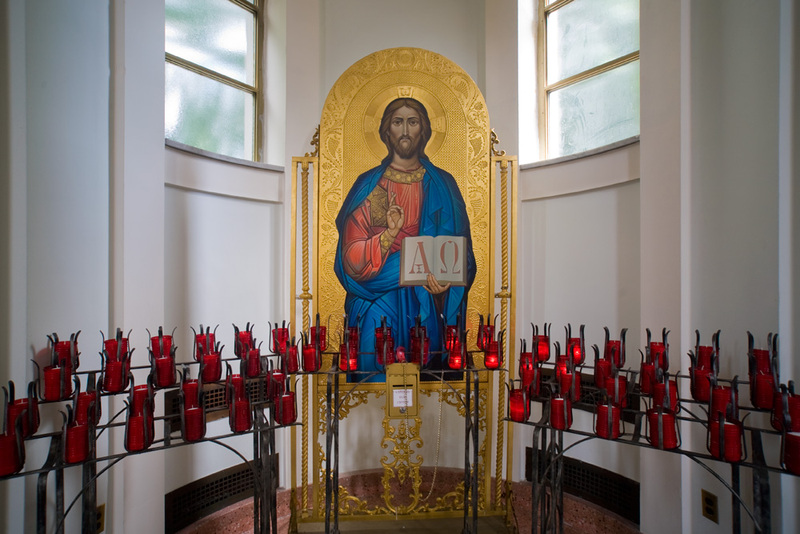 The following day, he paid visits to the Ukrainian Cathedral, nearby St. Peter’s Roman Catholic Church at 5th and Girard, and St. Charles Borromeo Seminary on City Line Avenue in Wynnewood. 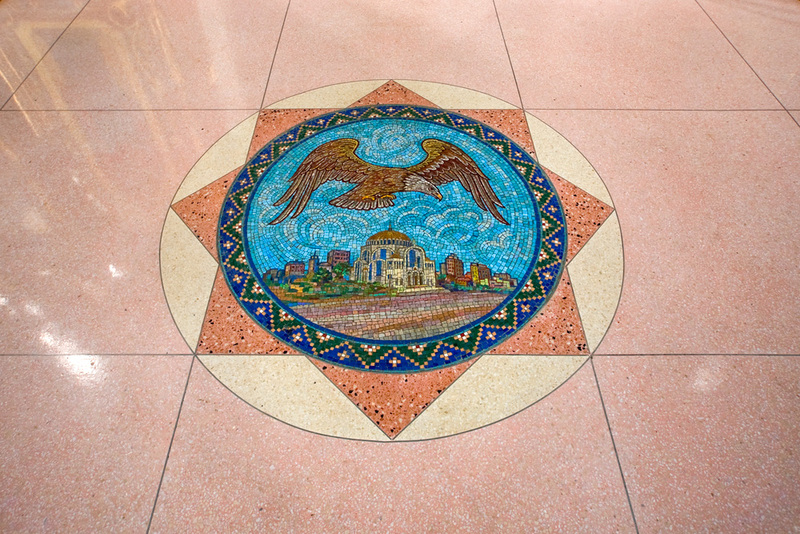 The left side of the entrance of the Ukrainian Catholic Cathedral of the Immaculate Conception of the Blessed Virgin Mary was later modified to honor the Pope’s visit with a mosaic by Dochwat. 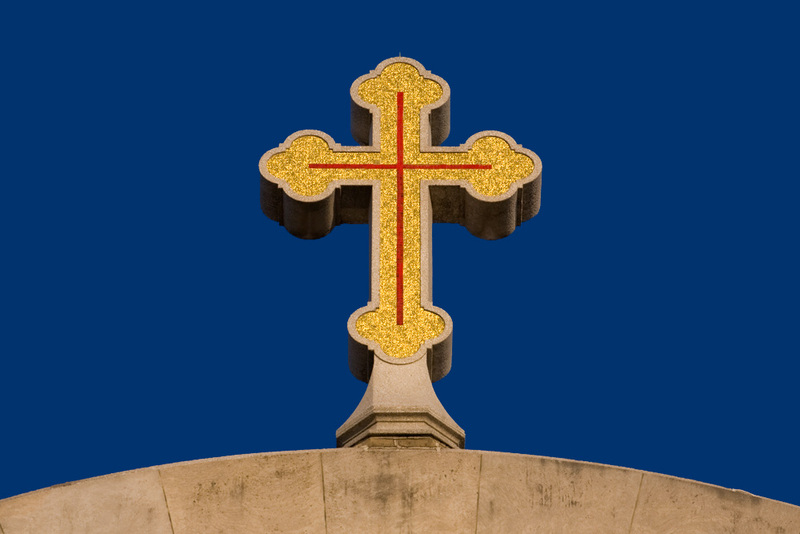 They’re keeping a place on the right side with hope for another honoring Pope Francis. To launch the gallery, click any of the photos below. 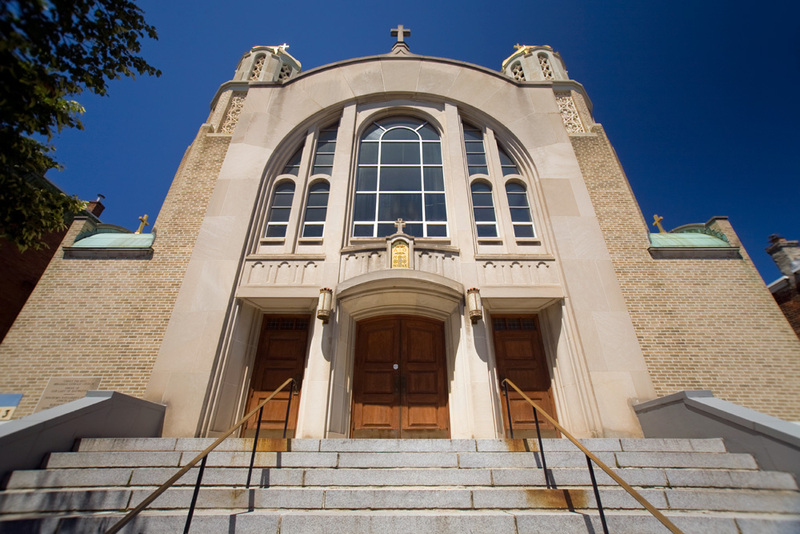 In my Northern Liberties book, I reported that when Pope John Paul II visited this church in 1979, Franklin Street was decorated with American, Ukrainian and papal flags and banners of welcome. And the city government swept nearby streets in advance. 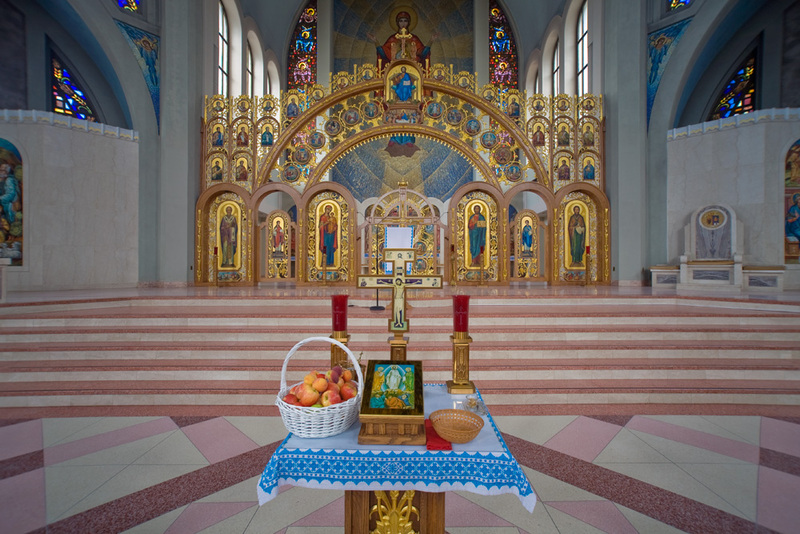 Local residents jokingly refered to that as a miracle attributable to the Saint John Nepomucene Neumann, whose remains are nearby at St. Peter the Apostle Church… Saint John Paul II addressed the congregation in both Ukrainian and English on this most memorable day. My children were students at this school when Pope John Paul II visited. We still treasure the picture of the Pope placing his hand on our daughter\’s head – the head of the church on the head of Cindi Dankanis. When was the aerial shot at the end taken? I see buildings that are very new in it near 3rd & George. Also, it\’s amazing how many churches you can see in that shot. Nearby St. Peter\’s. All the parishes up on Allegheny Ave. St. Micheal\’s on 2nd. St. Anne\’s on Lehigh Ave. St. Laurentius in Fishtown. St. Michael\’s Lutheran in Kensington. Even St. John Cantius and All Saints in Bridesburg are barely visible. I\’ll bet there\’s a few in there I missed, too. This was taken a couple weeks ago at Top of the Tower, the 51st floor of the Bell Atlantic Tower. 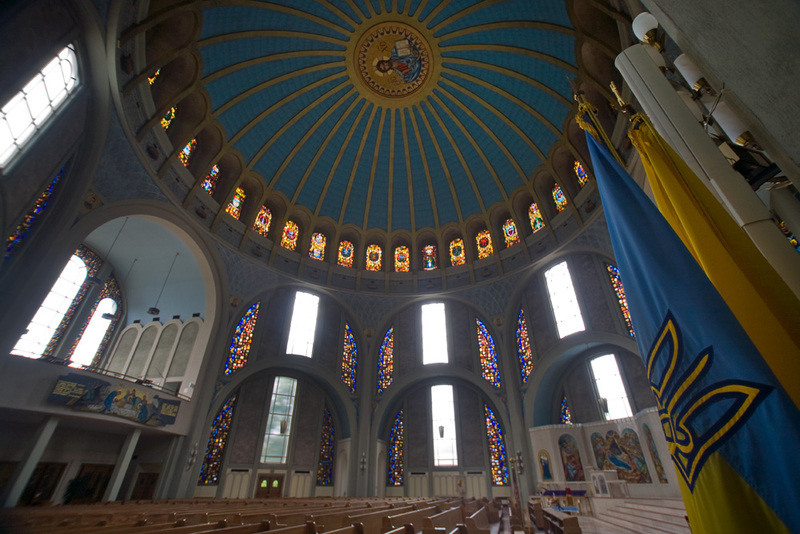 I thought it was pretty cool that the Ukrainian Cathedral, St Peter\’s, and St Michael\’s all lined up like that.